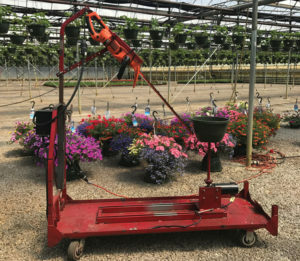 It only takes one person to operate Kube-Pak’s hanging basket trimmer, although it does take manpower for the entire trimming line process to work effectively. All the other individuals are either bringing the plants to the trimmer or hanging them back up after they have been cut. Over the past couple of years, Bill Swanekamp, Owner of Kube-Pak in Allentown, NJ, had been looking for an efficient and cost-effective way to trim hanging baskets, sales of which have been on the rise. As a solution, Swanekamp decided it was best for Kube-Pak to design its own automatic trimmer. The model it developed is adjustable on three axes, allowing the user to cut the hanging basket at any angle that they want. The cut stays tight to the basket, right under the lip for a close trim, or down at the bottom. It takes about five seconds to trim, Swanekamp says, which equates to 12 baskets trimmed per minute, or close to 720 per hour. Because the trimming is done right in the bay where the baskets are hanging, it reduces travel time and distance. 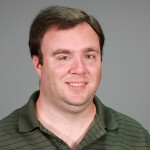 “You can immediately ship the hanging basket if you don’t want to hang it back up in the greenhouse,” Swanekamp says. The other main benefit is the cost savings. Whereas the old system used to pencil out at around $2.00 per basket trimmed, the new process cuts the savings down to about 25 cents. In a time of tight margins, savings like this can add up quickly. To watch a video of the hanging basket trimmer at Kube-Pak and see how it works, go to goo.gl/ezBPTy. There is no need to build such a machine when you can buy barely used high performance trimming machines dirt cheap on ebay. 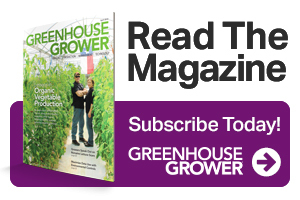 STEM Podcast – Insider tips for greenhouse pros: Consumer Insights from GrowIt!